TM and Copr. DC Comics. All rights reserved. Every writer wants to write stories that are memorable, change the lives of the audience, or appreciated as something special and unique. And yet every writer is guilty of crafting stories which look awesome but aren't, stories which leave the readers wishing they'd spent their time more productively, such as reading the phone book. One such example is "Lex Luthor Meets the Legion of Super-Heroes" from Adventure Comics # 325, October 1964, written by Edmond Hamilton and drawn by John Forte. Luthor, as every super-hero fan should know, is Superman's number one enemy: a bald, brilliant scientist who has bedeviled the Man of Steel since they were boys (at least in the original timeline). Their Silver Age feud began when Lex lost his hair after Superboy blew out a fire caused by a chemical experiment of Lex's gone wrong. 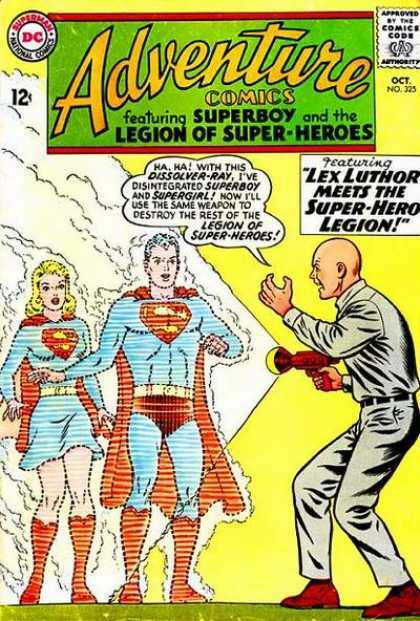 What most fans may not know is that Lex also fought Superboy's friends from the future, The Legion of Super-Heroes. But if you didn't know this story existed or forgot that it did, don't worry. Despite the promise showed by the cover, it's not a memorable tale. Analyzing what went wrong can help you avoid writing an equally forgettable story. Spoiler warning: If you don't want to know how this story turns out, don't read the rest of this post. This is one of those Legion stories which I know happened, but I often forget that it did until I re-read it. Then I remember why I had forgotten it. "Lex Luthor Meets the Legion of Super-Heroes" could have been an epic story, but it's not. Superboy/man's arch enemy finds a way to travel into the future and get his revenge on the Legion. How could such a story miss? Well . . . It starts off with an excellent idea that could have developed into an outstanding story. A pre-evil, pre-bald Lex travels into the future where he learns he is destined to become one of Superboy's greatest enemies. Oh, the anguish! Oh, the drama as the Legionnaires try to find some way to prevent this likable guy from becoming one of the worst villains in history. Well, that's what should have happened. Instead the Legion brushes Lex aside with enough scientific babble that would put Star Trek to shame and then merrily sends him on his way. But no matter. Lex's pre-evil status is a ruse anyway; he yanks off his toupee and reveals he's truly evil as soon as he's alone. Even at this point, the story could have been awesome as Lex puts his horrific scheme into motion. He builds a dissolver ray and ambushes the Legionnaires. He takes Mon-El, the mightiest Legionnaire, by surprise and he ambushes a handful of Legionnaires after calling them back from various missions. But by the time he disintegrates the rest of the Legion, all drama has dissipated as these scenes fail to build upon one another. Lex (who, oddly enough, serves as the story's protagonist) doesn't truly risk anything and has no obstacles to overcome. His victory over the entire Legion is far too easy. But wait! It's trick ending time. It turns out that Lex couldn't build a dissolver ray, after all (why not? ), so he had to settle for a paltry Phantom Zone projector. One would think if he could build the latter, he could build the former. But, in any case, it turns out he didn't actually dissolve the Legionnaires. He just sent them into that eerie, twilight place where Kryptionian criminals used to be sent and where no one ever ages. This turns out to be a mistake, as Lex's first victim, Mon-El, has plenty of experience with the Phantom Zone. Mon spent 1000 years there until a cure could be found for his lead poisoning. He leads his teammates into messing with Lex's mind so that it is Lex himself who unwittingly frees the Legion from the zone. His scheme foiled, Lex returns to the 20th century with his tail between his legs and vows further revenge (which he inexplicably fails to carry out). So, what does this story teach us about how write an unmemorable story? 1. Make your protagonist as unlikable as possible. 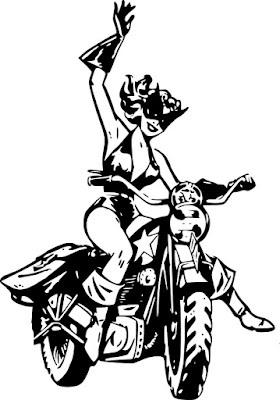 Here, Hamilton was constrained, in part, by the Comics Code Authority, which mandated that criminals be shown to be unsympathetic. But that makes it all the more odd that he chose Lex to be the protagonist of this story. Lex is as unlikable as they come. He's a classic Silver Age baddie, and, as such, not someone the reader is supposed to identify with. And yes, even though the title of the series is "Legion of Super-Heroes," Lex serves as the protagonist of this particular story. It is told mostly from his point of view, and he has a goal and actively seeks to carry it out--the classic definition of a protagonist. It's easy to see why Hamilton chose to tell the story from Lex's point of view; after all, he's the only character who knows what's going on. But, even so, it's hard to care about him, much less like him. 2. Make sure nothing is at stake. But sympathy--perverse or otherwise--doesn't happen. Lex simply sneaks up on the Legionnaires, presses a button, and they vanish. In effective stories, suspense is built when the characters take risks. Such risks are all the more necessary when the protagonist is a villain or antihero. In Adventure 325, Lex risks nothing. 3. Make sure nothing changes as a result of your story. If your story ends with the heroes laughing as the villain gets away, something's wrong. Granted, Lex couldn't be captured and sent to prison in the 30th century.Yet in an imaginative series such as the LSH and with a writer as creative as Hamilton, something should have happened to make this story worthwhile. The Legion could have mindwiped Lex into forgetting about their existence. Lex could have escaped on his own after the Legion struggled valiantly to capture him. He could have been transported back in time by another Legion villain, the Time Trapper, whose agenda is always mysterious. It doesn't really matter how the story ended--the Legion or Lex (and, by extension, the reader) should have learned something or been changed as a result of this story. Interestingly enough, the Legionnaires don't do much in this story. They have no competing goal that conflicts with Lex's, and they don't even struggle much to get out of the Phantom Zone, so it's hard to care for them either. Characters you don't care about + nothing at stake + nothing changes = recipe for a forgettable story. Conversely. if you want your story to be memorable, do three things: 1) give the reader a reason to care about your protagonist, even if he's a bad guy, 2) raise the stakes, and 3) have something of consequence happen.